When you’re anticipating a new movie, you will usually navigate to Google to try to find showtimes and theaters near you. While Google’s movie search has served its purpose thus far, showing you exactly what you need to know, it is getting an upgrade! 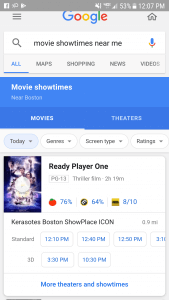 Previously, the Google movie search function showed you movie times and theater showings, which like we said, got the job done. Whether you were searching for a specific movie or theater, the results would usually tell you what you need to know.The new movie search still tells you the basics, movie times and theaters, but it also has a few added bells and whistles! The new movie search makes it extremely simple to buy tickets! 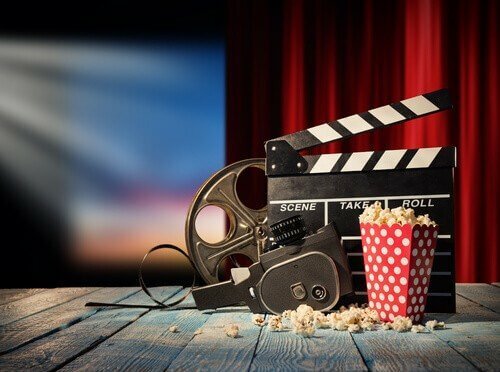 Instead of having to navigate through links and jump from site to site, with the new function, all you need to do is simply click on the time of the movie and a “buy tickets” pop-up will appear right there with ticketing agency options. Two clicks later, you’re ready for your movie! The new movie search will also now show reviews for each movie playing! Above the showtimes for each corresponding movie, there will also be reviews from major movie critic sites such as rotten tomatoes and imdb. 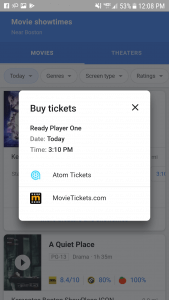 This can make it easier for users to decide which movie they want to go see! If you want to further refine your search, the top of the listing page now has filter options, and you can filter certain movie genres, specific theaters, ratings, and more! With Google’s new movie search results page, you have all the power in one place to make the most informed decision you can about which movie to see next, so grab some popcorn and enjoy the show! If you have any more questions about Google updates, contact Boston Web Marketing today!